Just to add to all the delays to Ixo's 1/43rd releases comes this latest French Altaya part work but this time in 1/18th! 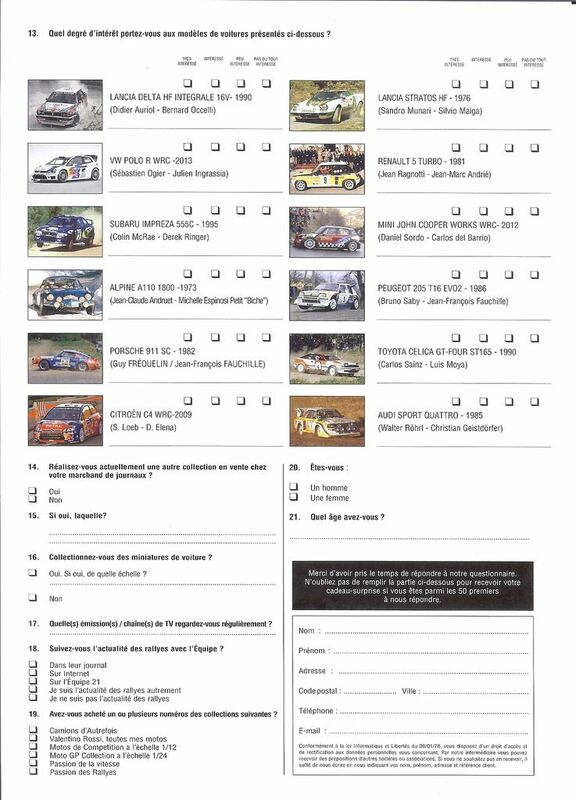 Artwork shows a Mini WRC and 205T16 E2 but first releases appear to include a Loeb DS3 and McRae Impreza. Some of these models were on Ixo's stand at last year's Nuremburg Toy Fair stand so seeing as this years show kicks off in a week or so will be interesting to see what they unveil for 2018 release! Will post some pics when it arrives. If I'd still collect 1:18, I could go for a couple of those. Did you receive the Impreza? If so what was the quality like? The Maltings wrote: Did you receive the Impreza? If so what was the quality like? Wow, totally forgot this thread. Yes, received it quit a while ago. It definitely has a budget feel to it (which is not a surprise). Totally sealed model & no suspension which I can live with. All markings are decals (which was a disappointment) and a lot were applied poorly on mine - crooked, half covering an air intake, damaged, etc. Looks fine on the shelf but not closeup. In reality I would probably buy more if they were easily available in the US but the shipping from overseas is almost as much as the model itself. I'll try to get some photos over the long weekend to add to the thread. Thanks for the update. Was interested as just seen that theres a 205 T16 E2 and Mini WRC scheduled for the next two releases Im guessing that Ixo will be releasing these models themselves as well at a higher price point obviously! Cool! Where did You see that the MINI WRC is one of the next two releases? It doesn't look bad at first glance. ...and more poor decal alignment: Pirelli to right of registration plate, skewed '555' logo, damaged Repsol logo. Also conspicuously absent are mudguards - bit of a stuffup even for a budget model, methinks. At least it didn't break the bank! Probably what Mitsui & Co looks like after a few pints - which would also explain the rear 555 alignment. Whoever applied the decals was all out of sh!ts to give that day, apparently. As was the QC department. I have a bunch of IXO (Hatchette) 1/43 and last few months ago bunch of the 1/24 partwork Japanese classic cars series. Details are OK on chrome work and decals/casting. The wheels however are for the most part really well done as is the paint. Looks like PB have killed my pics now..not going to be held to ransom so screw them. These are the announcements for 2018 so far..